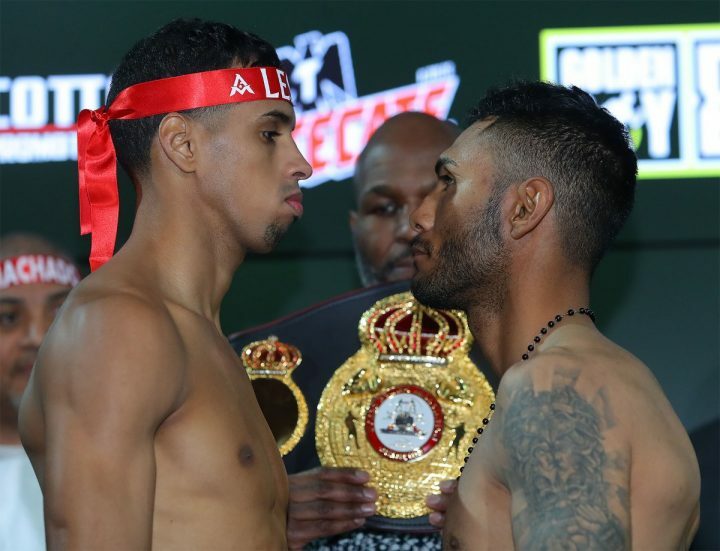 By Allan Fox: WBA World super featherweight champion Alberto ‘El Explosivo’ Machado (21-0, 17 KOs) weighed in at 130 pounds on Friday for his title defense against #9 WBA fringe contender Andrew Cancio (19-4-2, 14 KOs) for their fight this Saturday night on February 9 on DAZN at the Fantasy Springs Casino, in Indio, California. The 30-year-old Cancio weighed in at 129.8 lbs. This fight has mismatch written all over it. Cancio, 5’6″, is not only a shorter than the 5’10” Machado, but he’s a much weaker puncher and he’s nowhere near the same class as him. This fight is a showcase one for Machado to look good against a guy that doesn’t belong in the ring with him. This is a disappointing selection by Golden Boy Promotions for Machado’s third defense of his World Boxing Association World Super Featherweight title, because Cancio was recently knocked out by Joseph ‘Jo Jo’ Diaz in the 9th round in September 2016. Cancio has won his last two fights, beating Dardan Zenunaj and Aidar Sharibayev. A much more interesting fight on Saturday’s DAZN card is WBC super bantamweight champion Rey Vargas (32-0, 22 KOs) defending his belt against knockout artist Franklin Manzanilla (18-4, 17 KOs). Vargas weighed in at 121.4 lbs. His opponent 30-year-old Manzanilla weighed in at 122 lbs. This fight is going to be interesting for as long as it lasts. This will be the fourth title defense for Vargas, 28, since winning his World Boxing Council belt in 2017. Vargas has recent wins over Azat Hovhannisyan, Ronny Rios, and Oscar Negrete. None of those fights were close. The 5’7 1/2″ used his size and power to dominate those guys. Manzanilla at least will make it interesting for as long as this match lasts. Even if it doesn’t go many rounds, it’s expected to have a lot of fireworks. Manzanilla has a recent 4th round knockout win over Julio Ceja last May. Manzanilla, who comes from Venezuela, has losses to Belmar Preciado, Jose Sanmartin, Jorge Sanchez and Nelson Guillen. Former featherweight world title challenger Joseph ‘Jo Jo’ Diaz (27-1, 14 KOs) weighed in at 129.8 lbs for his 10 round fight against Charles Huerta (20-5, 12 KOs). Huerta weighed in at 130 lbs. This is another confidence booster fight for Diaz, who was beaten soundly by World Boxing Council featherweight champion Gary Russell Jr. last May. Russell Jr. was just too fast for Diaz. After that fight, Diaz came back strong in beating WBA ‘regular’ featherweight champion Jesus M. Rojas (26-3-2, 1 by a 12 round unanimous decision last August. However, Diaz came in over the 126 lb weigh-in limit, so he wasn’t able to win the WBA belt.